This Mytee 1001DX-200 Speedster offers power, quality, and affordability in one great heated extractor. 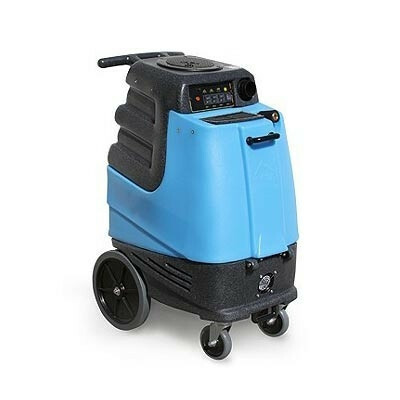 With the ability to distribute up to 210°F cleaning water with a 220 PSI pump and a vacuum that provides up to 130” in water lift power, you can give the toughest stains a run for their money. This machine is highly durable and is made to give you years of use thanks to a tough roto-molded polyethylene housing that resists rusting and denting. . The carpet extractor comes with a built in heater, and is powered by two power cords. The large 10” back wheels come in handy for transport and for stair climbing while the small front casters make for easy maneuvering around the job site. If you are looking for a non-heated version of this unit, we do offer the 1000DX-200 which offers all the same great features of this unit but without the heating element. You can also find other options in our complete line of box carpet extractors so you can find the right extractor for you. Be sure to pick up the right tools for you extractor like the Mytee carpet cleaning wand and a hose like our 25-foot vacuum-solution hose to pair with this machine so you are ready to clean when the unit arrives. Customers who were interested in the Mytee® 1001DX-200 Speedster® Deluxe Heated Carpet Extractor - 220 PSI were also interested in the following items. This is a review for the Mytee® 1001DX-200 Speedster® Deluxe Heated Carpet Extractor - 220 PSI.